While one can never truly have too much of that wonderful thing known as yarn, we certainly can find it a problem when it comes to keeping it organized and stored neatly. This is especially true if we don’t live in a large home or have our own craft rooms. I personally don’t have a craft room per se, but I am fortunate enough to have been able to claim a small walk-in closet as my own home office. This office came with built-in shelves, which meant I had a ready space in which to store my yarn. However, I am the first to admit that even this has not been the perfect system! Allow me to demonstrate. This is my yarn stash. (Well, most of it. Not all of it will fit, so some of it is in other places.) As you can see, it is VERY loosely organized, and frankly, it’s a mess. Look at all those messy strands hanging down! I also need to get rid of those plastic stacking shelves – I think it’s actually taking away from my available space. A third problem is that I have a hard time finding the yarn I want or need. It’s sort of organized by fiber, sort of organized by weight, sort of organized by type… as you can imagine, all those “sort-of”s mean that it’s really not well organized at all. So I am in just as desperate need of some yarn organization as anyone! The following are a selection of some basic steps that anyone needing to reorganize (or get organized in the first place) their yarn may want to follow. 1. If you have a large yarn stash, recognize that organizing is going to take some time. Some of us may be able to tackle it all in one day (even if it may take the entire day! ).Others of us may need more time, especially if we don’t have an entire day to devote to the task. 2. Do some pre-planning first. Decide where you are going to keep your yarn (and if you need multiple locations — remember that yarn doesn’t have to be all in one place, as some of us simply don’t have one single space large enough to house our entire stash). Decide what you will keep your yarn in, even if temporarily. You’ll also want to decide how to organize your yarn. Do you want to organize it by color, weight, fiber, type of project, or some other way? If possible, you might even want to store it one way, then in another way within that category. 3. Take one group of yarn at a time and sort it. If you need a temporary way to keep your yarn sorted, you could use plain plastic grocery bags. As you sort the yarn by the category you’ve chosen to organize by, you may want to also decide whether certain yarns are worth keeping. If you never see yourself using any of the yarn in your stash, and it doesn’t give you pleasure just to look at it, why hang onto it? You can donate yarn to so many places – knitting charities, nursing homes, schools, churches, children’s organizations, and the like. Just be sure before you donate that you ask the organization in question if they would like to receive your yarn! 4. Wind “messy” yarn. I’m sure you know what I mean, especially if you take a good look at that photo of my stash above! Some yarn is just falling all over the place. Winding it will help keep your stash so much neater! If you don’t have a ball winder (I don’t, though it’s on my wish list! ), you can wind your yarn by hand. You can even make center-pull cakes! Center-pull cakes allow you to knit two items at once or hold yarn double. They also tend to sit in place better without rolling about. Here is a great tutorial for hand-winding a center-pull ball. These are some basic preliminary steps. But there is so much more that can be said — and has been said! — about yarn storage and organization. I think the following links will help you decide how to best store and organize your yarn. At sea on how to best store yarn inexpensively? Wondering what to do with your equally vast quantity of needles? This article should help you tremendously. Too Much Yarn, Not Enough Space? Let’s Get You Organized! This Lion Brand blog post is pretty self-explanatory; it’s a great bit of help for someone without much space in which to store their yarn. 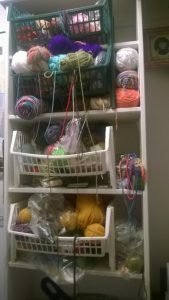 This is a collection of photos of the many creative ways in which people without much space have stored their yarn. Use this as inspiration! Another self-explanatory article that offers a collection of ideas on storing yarn without spending a load of money. Here’s a great step-by-step process in yarn organization. I’ve saved the deep stuff for last! If you want to launch a full-scale assault, this WEBS blog series is it. It’s a series of 31 posts to help you dig in and get your knitting supplies as well as your entire knitting process organized. If you are in truly desperate need of help without any idea where to begin, this series is for you! I hope that these tips will help you get your (and my!) yarn storage and organization under control once and for all! Want to see how I handled my yarn storage and organization issues? See my post here! Previous Post: « Can a Diehard Knitter Really Learn Crochet?